Bellevue is often ranked on lists of the best places to live in America, renowned for its views not surprisingly, as the name itself means “beautiful view” in French, with a wealth of green space and water, while the Olympic and Cascade Mountains provide a spectacular backdrop. Located across Lake Washington from Seattle, it’s the second largest city in the state, and a major employment and business center. Bellevue is renowned for its shopping, with many big-name upscale brand stores as well as elegant independent boutiques, and it’s also home to a myriad of fine dining opportunities, allowing Bellevue waterfront real estate owners easy access to everything they need, with the opportunity to come home and soak up those gorgeous views. Whether you’re into water sports like kayaking, paddleboarding, wakeboarding or boating, or someone who just likes gazing out at the lake, Bellevue is an ideal place to call home. There are lots of recreational opportunities on land nearby for Bellevue waterfront real estate owners, including hiking at Cougar Mountain Regional Wildland Park, and hiking, biking or even blueberry picking at Mercer Slough Nature Park, situated right in the heart of the city. Some of the best golf in the state lies within Bellevue or just a short drive away, and when it’s cultural attractions you’re seeking, you’ll have the Bellevue Arts Museum and the Bellevue Botanical Garden just minutes from your door. Bellevue waterfront real estate includes especially sought-after properties in West Bellevue, with some of the most luxurious neighborhood’s in the greater Seattle area, though you’ll find some great waterfront options in the quiet East and South neighborhoods of Bellevue as well. There are waterfront homes along Lake Washington in Enatai, on canals in Newport Shores and on Meydenbauer Bay, as well as homes on the eastern shore of Phantom Lake more inland. No matter what type of Bellevue waterfront real estate you’re looking for, you’ll be a world apart from the hustle and bustle of busy city life, yet just minutes away. West Bellevue lies along the eastern shores of Lake Washington and boasts some of the most sought-after waterfront properties in the greater Seattle area. With West Bellevue waterfront real estate, you’ll enjoy some of the most breathtaking surroundings in the region, including jaw-dropping views of the lake and the boats that glide across the water, the Seattle skyline, and majestic Mount Rainier towering over it all. Living in the state’s second largest city, a major business and employment center, means you’ll not only enjoy a tranquil environment at home, but you’ll be just minutes away from just about everywhere you need to be. You’ll find a wide range of shopping experiences, including many high-end brand-name stores, along with plenty of fine dining opportunities, entertainment, cultural attractions, nightlife and more, right in Bellevue, and even more options open up when you head across the lake to Seattle, just a 15-minute drive away. Of course, with West Bellevue waterfront real estate, you’ll enjoy convenient access to all manner of water sports, from boating and sailing to paddleboarding, kayaking and wakeboarding. There are multiple parks to take advantage of too, like Mercer Slough Nature Park, a 320-acre wetland with wooden boardwalks and shaded pathways for hiking or enjoying a scenic stroll. It also hosts several varieties of blueberries, and the opportunity to pick them too. Chism Beach Park, a waterfront park on the lake, offers a dock, picnic areas and a swimming beach with seasonal lifeguards. West Bellevue waterfront real estate is so highly desirable it tends to come at a steep price, but it’s hard to beat the lifestyle it offers. You’ll be living in one of the most luxurious homes, in one of the most idyllic Pacific Northwest locations, surrounded by the water and the mountains, yet just minutes from the delights of the city. Take advantage of our industry-leading tools to make your property search as easy as possible and be sure to register for a FREE account so that you can receive email alerts whenever new Bellevue waterfront real estate for sale hits the market. 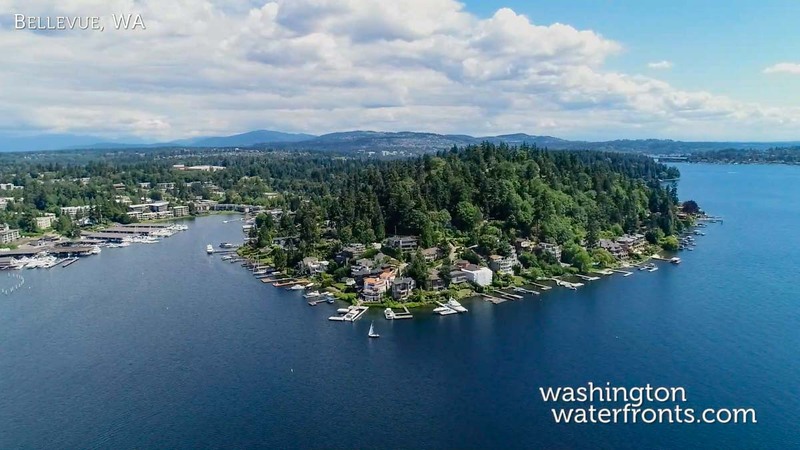 If you're seeking to sell your Bellevue waterfront property, contact our Waterfront Specialists directly for a comprehensive listing analysis and to learn more about the cutting-edge marketing strategies we'll use to sell your home quickly for top dollar!